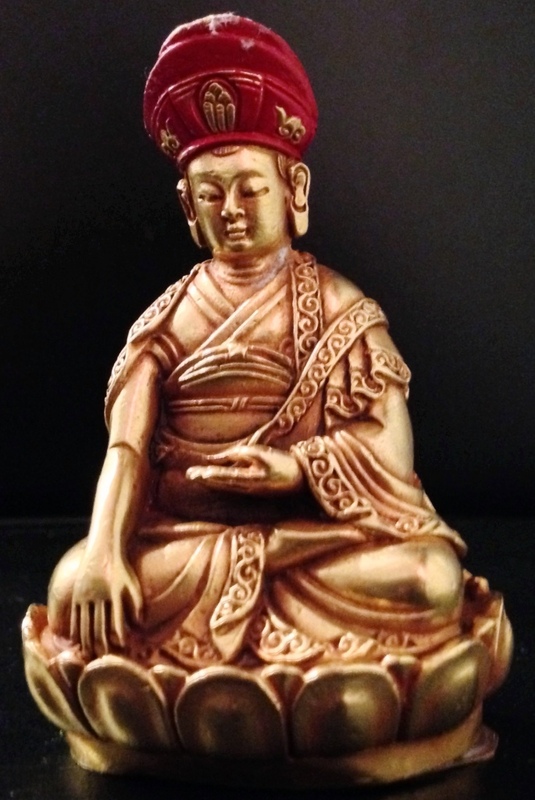 The Great Lord Jigten Sumgön (1143-1217) is the embodiment of the Buddha of the Three Times, reincarnation of Arya Nagarjuna, and Founder of Drikung Kagyu lineage. Of him the Buddha once said: “The fountain-head place of Dharma names Drikung will produce Ratnashri born in the hog year. He will be surrounded by a million-strong host of disciples and upon his death he will enter the Ngongai Buddha Fields. There he will be called the “Perfect White Buddha.” (Ghongdhu Sutra). Lord Jigten Sumgön attained Buddhahood in the Echung Cave at the age of thirty-five. When the first Karmapa, Dusum Khenpa, visited Drikung, he saw Kyobpa Jigten Sumgon Ratnashri as the Buddha himself and, developing great faith in him and receiving his teachings. The kings of India, China and Tibet all recognized him and Maldrozichen, a king of the Nagas, offered to maintain the growing number of disciples at Drikung. The Jigten Sumgon statue is filled with sacred relics and pills, precious ritual and healing substances, and rare elements – all offered and blessed by the current 8th Garchen Rinpoche and His Holiness the 37th Drikung Kyabgön Chetsang of the Drikung Kagyu lineage – as well as mantra of Lord Jigten Sumgon. Each Statue contains a small amount of perhaps the most unique, invaluable treasury of relics and holy substances ever put together in one place. The Statues have been carefully prepared, sealed and consecrated through prayers and empowerment rituals. Upon consecration, the statue becomes a representation of Lord Jigten Sumgon’s physical manifestation. Now over eight hundred (800) years have passed since the establishment of the Drikung Kagyu order, there have been 37 successive masters who comprise the golden chain of the Drikung Kagyu lamas. All these enlightened energies, blessings and teachings have been handed down through the great spiritual masters to the present 37th and 36th lineage holders, His Holiness the 37th Drikung Kyabgon Chetsang and His Holiness the 36th Drikung Kyabgon Chungtsang, as the Vaira-regent of Lord Jigten Sumgon. The Drikung is known for the Great Phowa Practice and great meditators. There are many stories about those who have attained enlightenment in one lifetime. The proceeds from Lord Jigten Sumgon statues will go to the Center’s new Building Fund. Any additional contribution beyond the suggested donation is greatly appreciated.